I've been using a rv for full time off grid in summer in Virginia, I spend winter 30 minutes from myrtle beach. Currently I have 2 6v us battery gc 208 amp hrs @12 volt. With 4 100 watt panels 18.9 vmp 5.29 imp. a 30 amp non adjustable pwm controller puts out 22 amps and 308 watts. About a c/10 charge rate. A hybrid system a 2000 watt generator for microwave a toaster and an occasionally couple hrs for a 8000 btu ac. For cloudy days a 35 amp charger. A small 300 watt psw inverter for tv. On to my situation I'd like to double my battery bank to 416 ahrs. My thoughts are that I need 800 watts. 44 amps for roughly c/10. Twice the bbank double the panels and cc amps from 30 to 60. 4 100 watt panels $400. A 60 tristar pwm $200 for a 25 or 30 ft array the wire and the mc4 fusing $100. =$700 for 100% increase in power for About $50 more than a 60 amp tristar mppt $650 Most mppt claim 35% increase in winter and 15% for summer or 25% annual average increase. (25% for $650 or 100% for $750??) I understand if the array is 120 foot away the cost of wire alone would tip the scale. But not for a 12 volt rv. I no that I still havery racking to deal with but am I missing something? Any input would be appreciated. In itself, an MPPT charge controller will not really increase your summer (warm weather) power production vs the proper solar panels and a PWM type charge controller. For rule of thumb designs, I use the same derating factor for both PWM and MPPT systems. For ~400 Watt or smaller solar system, PWM systems tend to be cheaper. For ~800 Watt or larger systems, MPPT systems can be cheaper and easier to wire up the solar array (high voltage solar array, smaller wiring is cheaper and can send power longer distances--Not usually an issue for RV systems). If you are in a hot region Vmp~18 volt panels can drop down towards 14.8 volts... Pretty close to battery charging voltage and less than Equalizing voltage (typically 15-16 volts). So, hot day afternoon charging/equalizing my suffer reduced harvest. With MPPT controllers, you can put a Vmp-array in the range of 30-100 VDC and you will not have "issues" with hot weather reduced finish charging/EQ charging. MPPT controllers tend to be newer designs and can have lots of networking, remote battery temperature sensor, and other functions available that "simple" PWM controllers do not. I would not make my decision that an MPPT controller will "outperform" a PWM controller for energy harvest (unless in very hot climate). I would suggest that you do a couple paper designs and see what works best for your needs (PWM with 140 Watt panels, MPPT with 200+ Watt panels, wiring for solar array, etc.). Paper designs are cheap. Buying hardware that does not meet your needs--Much more expensive. In the mountains of virginia we get 6 days or so of 86f so heat is not an issue. my low volt panels are $1 a watt. High voltage panels are cheaper per watt but with shipping to my area there's no savings.I'm not real sure about the tristar pwm but I think it's fairly adjustable with temp compensation. Bill On a different subject with a 1 kwhr per day usage 800 dc loads and 200 inverted. I figured 5 days reserve 2.5 days 50% soc 20% per day 1kwhr on pwm × 2 =2kwhr ÷ 5 sun hrs only 400 watts. adjusted to 800 for c/10 charge rate. 420 amp hrs and 800 watts of panels does my numbers sound about right to you? And solar panel wise, you should have 5% to 13% rate of charge. 5% can work OK in sunny area, during non-winter, weekend use. 10% or more for full time off grid. So, it looks like an 800 Watt array for your ~420 AH @ 12 volt battery bank (assuming you are talking about a 12 volt battery bank) would be right in the middle/sweet spot. And you are correct, that if you are only ordering less than a full pallet of solar panels, the 140 Watt and smaller panels are generally much cheaper to ship. A MorningStar PWM Tristar controller + Remote Battery Temperature Sensor should be a nice fit. Thanks. yes 12 volt bank for rv Im only there 6 months April -Sept Im 120 miles south of roanoke. I go back to the Carolinas for the winter. Sounds in the ballpark to me. On day 3, at 50% SOC, you have about a 2.5kw deficit. 800w panels tilted right etc might produce ~600w in full sun, which would about cover the deficit with 4-5 hrs equivalent full sun. With loads taking some of the solar, hazy third day etc, you may need to run the generator occasionally to give the solar a head start in the morning. In good weather, the solar would likely catch up in a day or two anyway though. I have my array pole mounted and adjustable. After a rainy day I move it 2 times before I go in for the night I set it to 120° the next day At 150° I move it to 180° seems to help by staying within 30°. I adj tilt monthly but I'm not sure of the best setting for each month? Where can I find info on that. Moving east to west in summer at higher latitudes would definitely increase production in summer. In summer, I generally get to float even after a couple of rainy days anyway though, and in winter, it wouldn't make much difference. In your situation though, I imagine it helps a lot on catch-up days. A 1000 watt array and 700 ah? with 800 watts I could have a 600 amp hr bank??? Whats your nightly usage; I never get to float after a couple dark days unless I pull the cord. But I'm working mine way too hard. The reason I need more battery capacity. 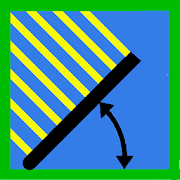 Try a phone app called Solar Tilt. It will give you the exact tilt for any day at your exact location, (GPS based), or anywhere on earth by latitude you input. Once you get the tilt you can lay the phone on edge on the surface of your panels and the tilt gauge will tell you the exact angle your panels are sitting at. VERY COOL. > A 1000 watt array and 700 ah? with 800 watts I could have a 600 amp hr bank??? Whats your nightly usage; I never get to float after a couple dark days unless I pull the cord. But I'm working mine way too hard. The reason I need more battery capacity. I assume you're referring to the 12v system in my sig? That part is meant to run light loads for a long time. A 12v fridge/freezer that draws little, and a few lights. In summer, 3 days no sun might get it down to 90%SOC. It's meant to keep the 12v fridge running for a week or more unattended if need be. In winter, there's less fridge load, more lighting load, so about the same overall. That bank has a pretty easy life, and will likely die of old age. I also run a 48v bank that runs pumps, tools, an AC fridge in summer etc. That bank will run down ~15-25%/day in normal use in cloudy weather. After a couple of cloudy days, I'll fire up the genny to charge if need be. It's rarely needed in summer, but likely in fall/winter. The 48v bank gets cycled deeper daily, so I expect it to die of work. I don't think you need to get to float after a couple of dark days. If you get to absorb voltage, or close, that's good enough. If you finish absorb and get to float weekly or so, that 's ok. Thanks for the app little harbor it's very useful. In reference to a 400 amp 12v battery bank. Can any one tell me Rougly how many hrs would it take to charge from 50% soc to 80 or 85% with a Iota 55 compared to a 35 amp charger on a generator. Lead acid batteries at less than roughly 80% state of charge are near 100% culoumb (spelling?) efficient. Meaning take out 1 AH, put back 1 AH. Assuming the charger is in bulk charge mode (battery voltage below 14.5 volts or so. Absorb set point voltage). Many chargers and alternators can drop their output current if running near or at rated current for longer periods of time. Iota is known for operating at rated output without derating after 10 to 20 minutes. I'm going to add on in steps first getting batteries. then upgrade from my 35 amp for a lota 55 charger for bulk.Naws has the best price I've found on them. And use my 400 watts for finish charging. Cc next and then panels 1at a time. Easier on the pocket that way. My generator at 1700 watts 14.1 amps.Derated .80 1360 watts 11.3 amps. A Iota 55 is 13.4 ac amp. And I've just learned you have to derate for high altitude. Bill you were right you recommended a 40 or 45 amp charger. You guys are awesome so much knowledge. And you don't make people feel like idiots. So with a higher pf like xantrex I could run a larger charger from my small generator. Iota International models? Where would i find those? Im aware of the new x model with a 3 year warranty. All i can find on Iota specs is ac amp requirements and .80 eff nothing on pf. The only pfc Iota I can find is for 24 volts. I think you are correct. That is all I could find on the Iota website (model family appears to be DLS-UI). I would expect that they will add to the product line over time... They are really decades behind the times here. Short of looking at the new Inverter-chargers (many have some very nice charging options), the Xantrex TC-2 series seem to be very nice (but not cheap). 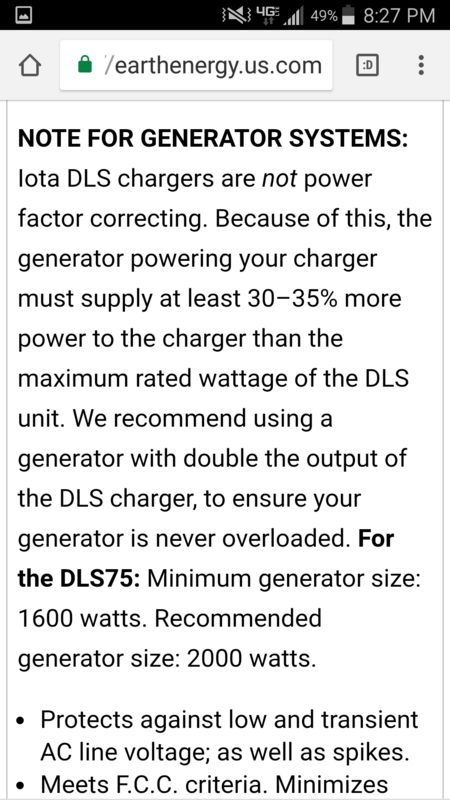 I found this generator size recommendation on the Iota 75. If this is correct a 55 on 1700 should work.? It appears that it should work... I would suggest as long as your generator is NOT an inverter-generator (not a Honda eu2000i or similar smaller inverter-gensets from Yamaha and other--Inverter-generator typically have very poor surge current behavior--If you exceed the i-g current ratings, they immediately electronically shut down... Standard gensets just keep on trying), it appears it would work. Just watch the temperature of the genset "head and windings" as it runs. Remember your high altitude deratings also apply to poorer cooling at higher altitudes too. You do have to check the ratings... A Honda eu2000i is rated for 2,000 watts maximum but only 1,600 watts continuous... What is the continuous rating of your genset? I would think cool mountain air would have been better for the generator, but guess not. 1700 watts14.1amps at 108 volts 2000 surge. I first got a honda 2000 it wouldn't even run the microwave.But this one New in the box 300 bucks 1/3 the price of honda IMHO twice the output 4 hrs per gal 50% load it will run my 15000 btu air unit. Which is way is to hard on it. Lugging all the time. my 20 year old 35 amp car charger at roughly 50% soc it hardly changes sound like it has no load.And oddly to me when I use the toaster in the morning while I charge. The voltage immediately jumps .3 or .4 volts.?? 55 vs 45 amps gives me 30 min less charge time.1 pint of fuel differance. I'll average 7 or 8 times a month charging.Really not worth driving your self crazy trying to get it perfect.As I think you once said. Everything plays together... Altitude reduces air density--less cooling. You are probably running the genset in winter when you have much colder weather--Better cooling. And most of the time... Good enough is good enough. In engineering... A factor of 2 (or 1/2) difference is almost negligible. A factor of 10x (or 1/10) is a night vs day difference (and you can usually "ignore" the smaller factor). It does depend on the battery too.. Tall batteries tend to need the higher charge rates to better "mix" the electrolyte while charging. Forklift/traction batteries also need 10% or higher rates of charge too (they also have high rates of self discharging, so a larger array makes up for the extra losses). 5% rate of charge is fine for Equalization. 5% rate of charge tends to be more of an issue if you are running loads in the daytime (too, or predominantly)... Those daytime loads reduce available current for charging the battery bank (to less than 5%). If you are montly weekend usage, then the weekday 5% rate of charge and no/low loads is an OK way to go. Generator charging is fine, but tends to be expensive. For many people, they charge (for example) from 50% to ~80% state of charge in the early monring, and let the solar continue finish charging. Gensets tend to be more fuel efficient at 50% or higher loading. Some folks even have used a smaller genset (like a Honda eu2000i or equivalent) for afternoon charging (during bad weather) as the batteries go above 80% state of charge (and the Lead Acid battery naturally limits charging current). As long as you are actively cycling the battery bank, you really do not need to get over 90% state of charge once per week (one battery mfg. even suggested to a poster here that you only need to fully charge a cycling battery once every ~28 days maximum). You do not need to get to 100% state of charge very often... That is mostly done when you "equalize" your battery bank (over charging "full cells" to bring up weak/less than full cells to 100% state of charge--Measure and long specific gravity)--Typically once per month (Trojan has suggested equalization when high to low SG variation is 0.015 to 0.030 or higher difference). Note that sealed batteries (AGM, GEL) do not need high voltage equalization. Doing an extended "absorb" charging cycle (4+ hours? Don't remember), has been suggested as the AGM "eq" cycle (once over 6 months). Just for 3 months Would it do any damage to the battery bank T105 If you have enough solar amps to support day loads plus 5%.charge rate. 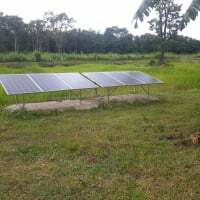 Run the generator at 50% to 80% for rainy days.let the solar finish. Then fully charge once a month and equalize if needed? You should be fine... The "conservative" approach would be to "fully charge" once a week (less conservative is once per month). Fully charged (excluding equalization) would be >~90-95% state of charge. Going to 100% SoC often (daily, even weekly) is hard on Lead Acid Batteries (basically near-equalization, gassing, loss of electrolyte, erosion of plates, positive grid corrosion--Oxygen forms on positive plates and causes grid oxidation). Also, keep batteries relatively cool (watch charging at >90% state of charge, Lead Acid batteries tend to get hot at this level, even with 2.5 to 5% rate of charge--Let batteries cool and start charging again the next day if equalizing stubborn low SG cells). This is the "theory" I have gathered from years of reading here... Anyone with differing or more detailed suggestions, please feel free to post. -Bill "not a battery engineer/expert" B. You just put the O in the wrong spot. Coulomb--Yep, got it to work (only when wifi connected to spell check with Google--Still could not get the off line spell check to work). Wow coulombs law. That's a lot to take in!!!! If it's hard for bill to spell it. I sure I'll never understand it.